I dislike being out of print and have grown tired of hearing myself whine about it, so I took the backlist into my own hands and have republished most of my novels myself, covers and all. So, I am for sale and can be purchased, and am trying my hand at a modest effort at self-promotion. I’m not very good at it, but am confident that with some practice I will become quite annoying. 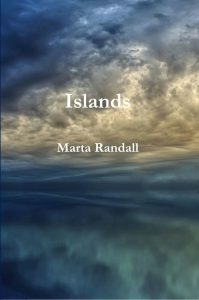 “Marta Randall is a sensational, subtle, precise, and gorgeous writer.” Karen Joy Fowler, author of The Jane Austen Book Club, Sarah Canary, and Artificial Things. ISLANDS A Nebula Award nominee. Science has conquered death, except for Tia Hamley. The Immortals, forever young and beautiful, turn life into games and baubles; fated to age and die, Tia demands that her life have meaning and searches for it from the amusement park of ice-free Antarctica to the land of damaged outcasts in Australia to an underwater expedition to the sunken Hawaiian islands. Her Immortal companions pillage the ruins for knick-knacks while she seeks mysteries. And finds them. 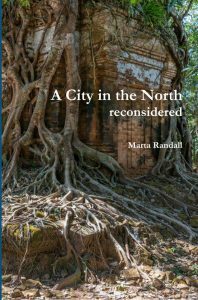 Why “reconsidered?” For one thing, I was very youngwhen I wrote A City in the North, and thought I knew a lot about a lot. As I grew older I realized that I knew increasingly little about little. The book still concerns itself with things I continue to find compelling: “civilized” society and cultural disconnects; relationships between sapient beings; the intersection of explorers, colonizers, and the colonized; adventure. And I admit that I am compelled to mess with things. Despite that last, I think this is now a stronger book, and a better one. I hope you agree. The first book in the Kennerin Saga. Fleeing the disapproval of Earth’s patrician families, Jason and Mish Kennerin have come to Aerie; distant, insular, inhabited by the enigmatic kasirene. 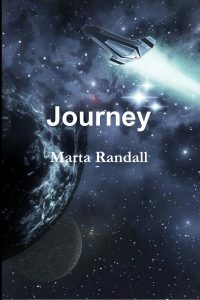 Here they carve out a new life for themselves and their growing family, until the death of a nearby planetary system forces them to open their world, and their lives, to the chaos of change and the genesis of an empire they both crave and resist. The sequel to Journey. The eponymous novella was a Nebula award finalist. Sometimes, to preserve a world, you must be ready to destroy it. The complicated and vibrant world of Haven is too rich a plum to be left in peace. This is the story of the people who cherish it, the people who want to conquer it, and the people who drive it to the edge of ruin. Forced by destiny and circumstance, the Kennerins, and those who love and hate them, pursue their separate fates from the reaches of deep space to Haven’s smallest islands, in a series of Dangerous Games where the stakes include the world and timeless, enigmatic tauspace. 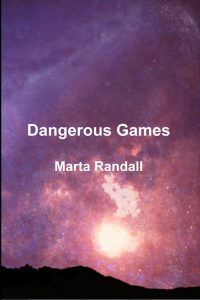 13 previously uncollected stories by writer and teacher Marta Randall, now including The View from Endless Scarp in addition to Lapidary Nights, The Dark Boy, Lázaro y Antonio, Big Dome, Sea Changes, On Cannon Beach, and Nebula Award finalist novella Dangerous Games.